This boat has it's own website http://www.aticusa.com/searaysundancer/ Main Details: Year: 2005 Class: Power Category: Cruiser (power) Year: 2005 Make: SEA RAY Model: 260 SUNDANCER Length: 28 ft (with with std. extended swim platform) Engine: 300HP Mercury 350 Magnum MPI Bravo II Engine Hours - Total Since New: 246 Hours: 246 Engine/Fuel Type: Single Gas/Petrol Fuel: 84 gal Cruising Speed: 18 mph Max Speed: 28 mph Propulsion Type: Single Inboard/Outboard Hull Material: Fiberglass/Composite Fuel Type: Gas Fresh Water Tank: 28 gal Key Features: - Fully Air conditioned! - Includes Optionial 5.0 kW Kohler® 120V/60 Cycle Gas Generator with Remote Start, Stainless Steel Exhaust Outlet & Freshwater Cooling. - Sleek new design for 2005. - 8'6" Beam for easy trailering. - Standard SmartCraft™ instrumentation and diagnostics. - Integral swim platform with four-step stainless steel ladder. 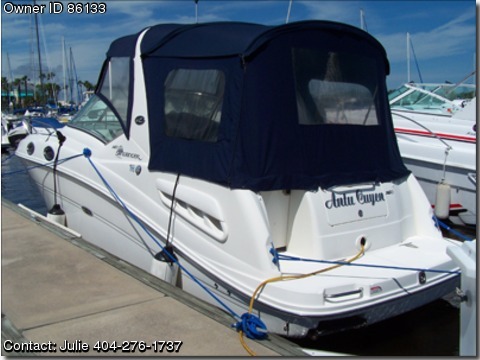 - Full Canvas Bimini (aft curtain, bimini top w/boot, front curtains, side curtains and a canvas storage bag). - Translucent deck hatch with locks and sky screen cover. - Transom storage compartment with gas-assisted lid (for lines and fender storage). - Bucket helm seat with flip-up thigh-rise bolster. - Aft-facing cockpit seat easily converts to sun pad by simply sliding the seat aft (no cushions to store). - Curved portside lounger. - Removable carry-on cooler with designated storage. - Twelve beverage holders. - Electrically actuated engine hatch. - Molded-in boarding steps. - SIRIUS Satellite sound system with Clarion Multi-CD Disk changer. - Starboard VacuFlush® head. - GARMIN Color GPSmap 182C GPS/Chartplotter. - Premium cockpit sound system with upgraded component speakers. - Cockpit wet bar with Corian® countertop. - Cherry wood Formica® interior cabinets. - Stainless steel thru-hull fittings. - Convertible dinette with dedicated v-berth filler cushion and table storage. - Full galley with sink, stove, refrigerator, & microwave. - Meets Applicable USCG, NMMA and ABYC Standards - the highest "building code" standards in the industry. - Mercury® iQ certified.